Mycobacterium tuberculosis is the most common infectious agent in the world. Nearly 1/3 of the world population is infected, and a drastic number of these are increasingly antibiotic resistant. MDR-TB and XDR-TB are becoming more commonplace everyday, especially in regions that are combating HIV infections. As such, it is incredibly important to study how this bug works. It is one of the most difficult organisms to work with due to a wide variety of factors. These include: slow growth rate, pathogenicity, very waxy cell walls, high levels of illegitimate recombination, and a bunch of other nuances that make the mycobacteria unique among its relatives. One unique feature of the mycobacteria, is their unique acid-fast staining pattern. It has been shown that when treated with isoniazid (the most prescribed anti-TB drug), mycobacteria lose this pattern of staining. Therefore, one can extrapolate that their outer cell wall (filled with extremely long-chain lipids, called mycolic acids) plays an important role in both the lifestyle of M. tb. and its pathogenesis. Two genes have been identified as having roles in mycolic acid synthesis, kasA and kasB. KasA has previously been shown to be essential (J Bacteriol. 2005 Nov;187(22):7596-606. ), with kasB serving a non-essential accessory function. 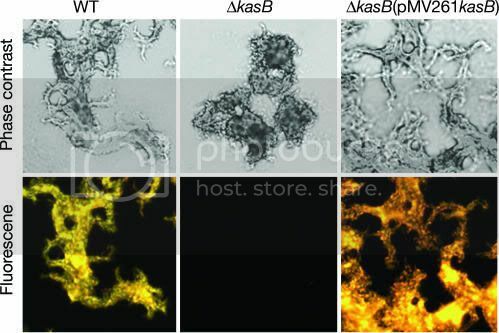 This paper, from Bill Jacobs’ lab at AECOM, shows that although kasB is nonessential, it is necessary for acid-fastness AND it has a large role in pathogenesis. They first knocked out kasB using a specialized transducing phage. Knockouts of kasB had a severe deficiency in colony growth and a large change in colony morphology. Also, kasB mutants lacked acid fastness and were exceptionally more sensitive to rifampicin. Further biochemical analysis showed that kasB is likely involved in the production of specific mycolic acids. However, the story gets more exciting. Immunocompetant mice that were infected with the kasB mutant, showed no signs of infection—there was no formation of granulomas and no mortality. In contrast, mice infected with wild-type died within 356 days. What is interesting to note is that although mice infected with kasB mutants did not show pathology, they still had measurable amounts of bacterial growth—indicating a persistent infection that was not able to become active (Fig. below). The same study shows that kasB mutants act nearly identically to wild-type in mice that are immunocompromised. This means that mycolic acid production by kasB plays a role in the immune systems ability to hold M. tb. infections in check. The authors suggest a variety of implications that their very exciting findings bring to light. For one, due to the phenotype, kasB mutants could be used specifically to study persistant infection. Secondly, kasB is clearly a candidate for deletion in an attenuated vaccine strain. Finally, and I think most importantly, this mutant shows a potential drug target for secondary drug therapy. Drugs that act on kasB or kasA could be developed in conjunction with rifampicin and isoniazid treatment. XDR-TB cases are present in 41 countries, including the US. It is vital that we develop new lines of drugs and continue identifying drug targets. TB presents an event where scientists, public health departments, and drug industry must come together and work as a single entity. The amount of TB cases is ever increasing and I fear that the days of the sanitarium may once return to our country. I am starting a brand-new carnival with a focus on molecular and cell biology and, after considering your blogs, I would like to invite you to submit a post of your choice for the upcoming carnival. You can use the submission form over at blogcarnival.com, and check out the submission guidelines over at the MCB Carnival webpage. I would be honored to see your posts included in the inaugural edition. And of course, if you wish to host one or more future editions, feel free to contact me.